This tasting was presented by Jean-Louis Chave, winemaker and owner of this, one of France’s most respected estates. Jean-Louis shares these responsibilities with his father Gérard. Together they are the men behind an estate that is widely regarded as one of the world’s greatest. From their winery in the Northern Rhône Valley, where they own some of the finest sites on the hill of Hermitage, they produce both red and white Hermitage wines that are generally regarded as being among the finest of their kind. Demand for the wines is huge, and critics like Robert Parker regularly award scores in the high 90s to them. About one quarter of Chave’s Hermitage vineyards are planted to the white wine varieties of Roussanne and Marsanne, three quarters to Syrah, the single grape of red Hermitage. 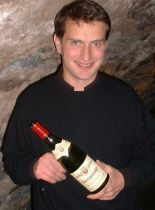 Jean-Louis is an out and out “terroirist”, believing that the qualities of his wines spring from the vineyard’s position, soil and climate, not purely from the condition of the grapes produced. The vineyards are farmed organically and worked by horse and plough. Only natural yeasts are used in fermentation. Without the assistance of laboratory-designed yeasts this can mean fermentation is a long, slow process – Jean-Louis cites some vintages of their white Hermitage continuing to ferment for a whole year. The wines are aged in a combination of new and old barrels for up to two years, with no batonnage, or “lees stirring”, which Jean-Louis claims only oxidises the wines and does not lead to such a rich texture in the mouth. The white Hermitage is low in acid, but although sufficient acidity is one of the keys to ageable white wines, surprisingly these whites are incredibly long-lived. Jean-Louis has tasted 1880’s bottlings that are still going strong, and the 1988 on tasting here was powerful and youthful. This longevity is achieved by the wine’s glycerol-richness rather acidity, a product of the specific soils in his vineyards. He advises the whites are not chilled too much, and are always decanted for a short period before serving. The red Hermitage is the product of blending seven different plots on the hill of Hermitage, each of which has different soils and sub-soils .Jean-Louis says theses soil differences are huge, not subtle, and profoundly affect production. He therefore harvests and vinifies each separately and blends only after two years in his cellar to achieve his final, definitive Hermitage. Some vineyard add tannins, others flesh and others fruit. He says that each year he is “trying to make the ultimate expression of Hermitage”, not just great wine. He denies that there is a definition of ‘Hermitage’ however, and that the best wines will be created both by the Hermitage terroir, and the unique conditions of that particular vintage. He is quite scathing about some modern practices that are commonly cited as essential for making great wines. ‘green harvesting’ is one example, where the vines are thinned during the growing season to remove bunches, in the theory that the strength of remaining bunches will be enhanced. “Why do you need to do this if you are taking care of your vineyards and fertilizing properly?” he says, “good farmers don’t have to artificially restrict their crops”. The cellars that Jean-Louis is gradually taking over from his father have changed a lot and have been modernised, with temperature controlled equipment for example. He recounts the story of the 1982 vintage (one of the first he worked with his father) and remembers being sent off to fetch bags of ice cubes to dump around the tanks in a frantic attempt to cool things down in an autumn of record temperatures. And so to the wines. This tasting was organised by Chave’s Scottish agent, Raeburn Fine Wines of Edinburgh. This was a profoundly impressive tasting, with remarkable consistent, yet wonderfully nuanced wines, both red and white. Even fairly poor years for the Northern Rhône, like 1982, have produced suberb wines in the hands of these conscientious and gifted winemakers. Around 1,000 cases of Hermitage blanc are produced, and 2,500-3,000 cases of rouge. An outstanding tasting, of outstanding wines. (2001) Colour assessment is difficult in Raeburn’s 16th Century cellars. This was bottled in late September 2001, and has a beautifully limpid nose that is honeyed and rich with notes of vanilla, nuts, little floral aromatics and hints of fig. The richly-textured palate has fine but bold fruit. It is very punchy, with gripping acidity and powering concentration into a long finish. A baby, but very good indeed/excellent. (2001) More compact, muscular, richly powerful nose. There’s a core of lightly toasty oak, with aromas of brazil nut, apricot and peach. Full-bodied, the palate has a nutty quality again with juicy, tight, apricot and peach skin fruit that has a bittersweet quality. Lovely balance an length again. This is very youthful and powerful and need considerable time. Very good indeed/excellent. (2001) Beautifully alluring nutty nose, lots of buttery Brazil nut and hazelnut notes, even a waxiness along with peachy fruit and hints of blossom. The palate has fine quality, with tight, focused, plum and apricot fruit and a lovely waxy quality to the texture. This wine feels as if it is resolving itself from powerful separate components, and is very well-balanced into a long, lingering and complex finish. Excellent. (2001) Much more pungent, big, nettly nose with forceful vegetal quality then that same quince, fig and buttery, nutty fruit quality pushes through. Beautifully resolved on the palate, this still has massive power and concentration, but there is lots of fleshy, juicy fruit and tight, freshening acidity still there. The finish is again long and perfectly poised. Very good indeed/excellent. (2001) St-Joseph sits opposite Hermitage, on the other side of the Rhône river. It is a large appellation. producing good quality syrah reds at much lower prices than Hermitage or Côte-Rôtie. This has a slick of vanilla on the nose, over tight, slightly liquoricy, herbal, peppery fruit. On the palate it is tight and leathery, with a deep seam of serious black fruit, with more ripeness and openness towards the finish. Balanced and promising. (2001) Much more developed syrah nose with notes of bacon-rind, pepper and a schisty, earthy quality. This has a deep, dark palate, again with a tight, liquoricy grip, richer berry and blueberry fruit and a little raspberry brightness too. Good tannins and this is long, delicious and drinking well. Very good indeed. (2001) Lovely seam of deep, dense black fruit that is creamy, with chocolate and plum depth and a little bit of earthy richness. Gorgeous palate, a really silky texture and flooded with sweet berry fruit intermingled with vanilla and lots of pure, silky finesse from fine tannins and balanced acidity. Very pure, very long, and excellent. Surprisingly approachable, but seems balanced and built for the long haul. (2001) A little bit reductive at first, then those schisty, gravelly qualities break through, along with leather, game and deep berry fruit. The palate is powerful and muscular, quite sinewy with chewy black fruit and massive, dense tannins. This has wonderful concentration and is extremely long. Excellent and again, a profound wine to be cellared. (2001) Wonderfully fruity, open nose with raspberry – almost jammy – aromas and a background of gentle oak, again supported by a gamy, animal depth. This has fine structure again, with a big, clamping streak of tannins over firm, muscular fruit and again terrific length. (2001) Distinctive, complex nose of animal, game, leather and pepper. Meaty, dense and powerful impression. The palate is loaded with ripe, mouth-filling fruit, given nerve and sinew by a great thrust of acidity and cherry-skin tartness that freshens the finish. Lovely, complex and fruity stuff with great length. (2001) Another powerful nose, schisty, gravelly mineral qualities, but plenty of sweet, perfumed fruit with notes of caramel and again a lovely animal edge. The palate is quite dry and savoury, with a serious, tannin and acid backbone and a nice fleshy texture. The fruit does push through and has plenty of ripe sweetness, but the balance of this vintage doesn’t sing quite as purely. Jean-Louis thought this was rather closed, so my verdict of very good indeed might well turn out to be too cautious. (2001) This was the ice cube vintage, and though a legendary claret year, is generally regarded as only moderately good in the northern Rhône. This has a beautifully perfumed nose, with fantastic, almost Burgundian qualities of game, blood, truffle and wild, fine herb and briarwood notes. Leather and pepper too. The palate has lovely cherry-like sweet fruit that is beautifully elegant, fleshy, ripe and round. There is plenty of savoury mellow tannin and acidity, cedar and lovely integrated flavours. Absolutely delightful. Outstanding drinking now, though maybe deserves an ‘official’ excellent classification within this line up of wines, most of which are 10-years off their prime. (2017) Gorgeous perfume here; old roses and violets, spice, cherry and raspberry. Little background notes of leather and coffee. Lovely silky texture, with a delightful sense of resolution: sweet, mellow berry fruits, soft acidity and fine, svelte tannins. Very elegant, very lovely texture and again drinking beautifully, though not quite the lush density of the 1982.